$45.99 & FREE Shipping on orders over $59. (Makes 5 gallons) MoreBeer! is proud to release this Black IPA recipe designed by our local homebrew Club D.O.Z.E. 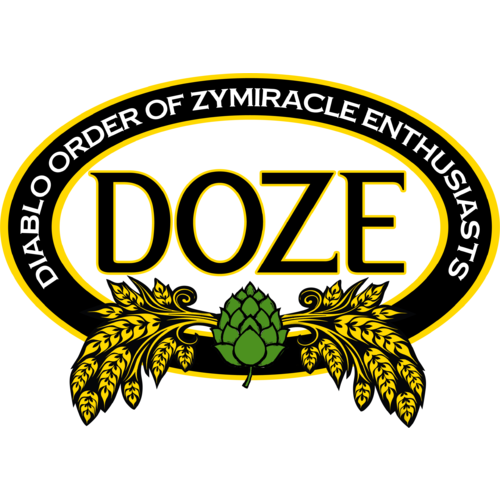 After winning the AHA Homebrew Club Of The Year in 2010, the Diablo Order Of Zymiracle Enthusiasts (DOZE) put their minds together to collectively craft a beer they felt representative of the club and its brewers. The initiative was taken on as an all club project that spanned 5 months. In the end, over 50 members contributed ideas to this recipe and nearly 40 individual batches brewed by 23 DOZE members were tasted and refined to a single recipe. This beer is inspired by the style many refer to as Cascadian Dark Ale or Black IPA, however it is not intended to fit the mold of any particular guideline. Mostly it is big, dark, hoppy, and delicious. The recipe was coined 'Diablo Dark Ale' in honor of our near by Mt. Diablo. Members of the Diablo Order of Zymurical Enthusiasts live in various cities located at the base of this great mountain. Also the location where many of us from MoreBeer! go mountain biking when we get the chance. Best beer I've had yet. did this one a while back and it was great. Malt and hops, best of both worlds. Looks like the kits may have changed. I have brewed this before and bottled it. I would like to brew this recipe again and bottle half and Keg half. Does this kit come with Priming sugar? Do I need it if I Keg it? BEST ANSWER: Hello Wayne - Counter Pressure Bottle Fillers work wonders in these situations. 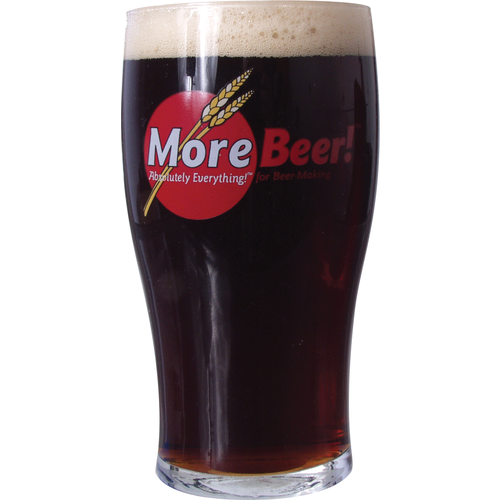 You have the ability to keg the whole batch, then bottle from the keg with perfect foam and co2 levels. This is a great recipe mine turned out fantastic. Yes the kit comes with priming sugar. I always bottle a few 22oz bottles after fermentation as I like to see how the beer ages, when bottling I use priming drops as opposed to using the priming sugar as most goes to keg. When kegging I do not use priming sugar as the co2 will carbonate the beer. When using priming drops I use 1 per 12oz bottle and 2 for 22oz bottles. I hope this helps answer your question. The kit comes with priming sugar. It's enough to prime a 5 gallon batch. If you are only bottling half a batch (2.5 gallons) you only need half the pack. For kegging, I don't believe you need priming sugar as generally you'd use CO2 to carbonate the brew. I ordered this kit 3 months ago. It did come with priming sugar. But if you Keg it and carbononste with carbon dioxide via a carbonating stone, you do not use priming sugar. Yes it comes with priming sugar. You can carbonate with sugar in the keg but it is easy to carbonate with bottled CO2. Awesome and easy! Will order more and more and more...?? I hesitate to call any one kit my favorite, but if I did, this kit would be at the top of the list for that honor! Great roasted flavor that is tempered with a great mix of hops....love the Simcoe in the dry hops! The beer poured with a beautiful white head that contrasted so nicely with the clean, clear black body. Wonderful mouth feel and aroma rounds out this great kit! One of the best beers available. Smooth,rich with a nice bite. You won’t be disappointed. I wanted to ensure that I contributed to this because it was after reading reviews that I decided to purchase this kit. I like Black IPA's, unlike most people I have come across. The brewing instructions were pretty generic and I wish that more beer provided brewing instructions more specific to each kit, but I get that they are going for simplicity. The brewing instructions were easy to follow. I took another reviewers advice and added an extra 1oz of fuggle hops to 60 minute boil along with an extra 1oz of Centennial to the dry hop. Primary for 3 weeks. Dry hopped for one week. Results were fantastic. Nice roasty base with bitterness and hop bite. I was hoping for more hops on the nose but for that I would probably need to do a double dry hop with more hops varieties. Either way this is awesome and I would brew this again. The best IPA I've ever had.....and I made it! I'm not usually a IPA lover....I don't like very bitter beers, but that's not to say I don't like hoppy beers! This dark IPA is very balanced with some great hop taste. It's one of the best beers I've ever made and will most likely have a permanent home on my 4 tap! I threw in the bottling sugar and 50% of the LME the last 15 minutes of the bowl, used California Ale yeast WLP001. Try this beer, you won't be disappointed! This beer has the best of both worlds: Strong hop flavor/aroma combined with dark and roasty malt flavor. The perfect brew and my favorite so far. Avery good ipa .My wife and my favorite black IPA. I just opened a bottle last night after conditioning in the bottle for about three weeks, and This brew is one of the best I have made from More Beer. This will be one of those brews that will be on a regular rotation. I actually have my second kit in my basket ready to check out and i only finished one bottle of the first batch so far. This is a great recipe , nice hoppy flavor I will be making this one again. This was another kit I brewed for a friends wedding. The craft beer lovers, couldn't get enough of it. This makes my top 3 kits so far. It has a more hoppy flavor at first but as it ages the dark malt flavors takes over. I will do this one again. I have been brewing and making my own recipes for about 7 years. I have made mostly great beers and a few that weren't so great. This was actually the first "Kit" beer I have ever brewed. I was shocked. It is SO GOOD!!! It has a nice hoppy flavor and a little bit of a smokey clean flavor from the malts. Hands down, the best black IPA I have ever made. Everyone else thinks so too. This was my fourth homebrew - first time using a secondary and first time dry-hopping. It turned out great, as Black IPAs go, this one was definitely more Black than IPA, but that suits me quite well. I used and recommend White Labs WLP001 California Ale Yeast for this recipe. It's a beer to be proud of. This Black IPA exceed my expectations. We brewed this in March 2014 with a full boil, 10 days in Primary and 10 days in secondary. Also to mix things up we put this beer on beergas! The creamy head we got out of our stout faucet was truly outstanding. I would recommend this beer to anyone who loves a fresh hop flavor and nice malty mouth. The hops were perfectly balanced to provide the fresh hop flavor and balanced out by the malts to give you a full smooth beer. 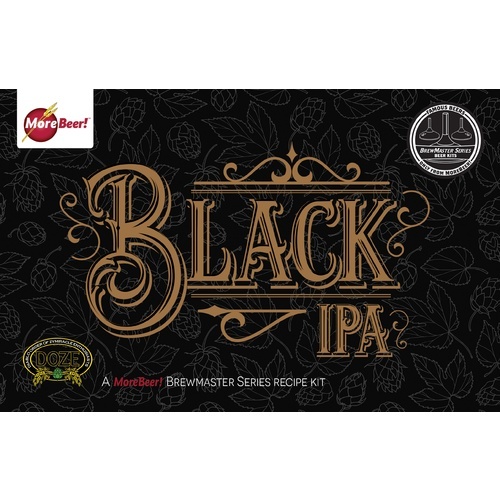 If you are thinking about brewing a Black IPA brew this one. I would stand this beer up against any commercial Black IPA I have had. I brewed this as one of my first ever homebrews and it turned out amazing. Everyone that tried it, couldn't believe that I brewed it myself. Only thing that I'll change the next time I brew it, is that I'll hit the dry hops a little earlier into the fermentation. Cheers! Absolutely fantastic beer, my favorite kit from morebeer.com. It was good from day one, but continues to get better after 3 months in bottles. It's a great balance of hops and malt. Brew this as soon as you know what you're doing! Followed instructions perfectly. Pitched a yeast starter of US-05 at about 25C. A little warm, but no fusels detectable. Primary for 3 weeks at 20C. Dry hopped for 5 days before cold crashing at 4C for 3 days. Bottled with all 4oz of priming sugar. Conditioned at Phoenix room temperature (25C) for three weeks. Tastes amazing! I've received more compliments from this beer than any before. I will definitely brew this again. I love a CDA and this kit turned out really good. We're buying this one again! This is my favorite of all the beers we've made. I love porters, my husband likes IPA's. This was a nice compromise (and I call it an IPA with Training Wheels for people who are trying to branch out of their malty comfort zone). Love this beer. Neighbors love it too (and not because it's free). I'll be keeping this one on the repeat-buy list. This was my first foray into the world of cascadia ales and black IPAs. I was really pleased with this kit, the beer came out very well. The whole process was very straightforward. Complemented my own regular IPA recipe very well. Would definitely buy this one again. This was the my third batch. Steeping grains show your right away this will be an assertive beer. Lots of great hops. Strong taste without being too bitter. Got to do my first dry hop with this batch. So for me it was a great kit to learn various steps (steeping, lots of hop additions, dry hopping) that i look forward to using more frequently as i try more batches and bump up to all grain. Did i mention it tastes good? Great beer! Even if you make a mistake! This is a great brew, but I would warn you that it does come with a lot of specialty grains - and you may need to keep this in mind when you approach your brew day. I packed too many gains into a small muslin bag, and I didn't get as rich/dark of a beer as I was hoping for. It was more of a dark, dark brown IPA than a black ipa. With that said - I brought about 18 of these to a party and they disappeared. Everybody loved them, and my good buddy who fancies himself an connoisseur of IPA rated this higher than his favorite commercial. Not bad for my third batch ever! I highly recommend this beer and will be making it again. I was expecting more hop flavor, but it was still a good if unusual beer. I would recommend for those who want something out of the ordinary. I've been brewing for 20 years and change my recipe almost every brew, but this is one hell of a recipe that deserves multiple batches. It's dark and a tad roasty, but topped off by a lot of hop goodness. I shared it over the holidays and it was a smash hit, now I gotta make another for myself. Totally recommended. This is a great beer. Great hop flavor and aroma. I can't stop drinking this beer, plus this is the first ipa my wife will ask for and finish. This was my eighth batch and it is a great beer. Nice, strong flavor, along the lines of a porter, not a session beer but I'll drink this anytime. Of the eight kits from MoreBeer I've made, this is by far my favorite. Time to brew some more.